A streetcorner outside Fenway Park is an odd place to receive an education. But as Daisuke Matsuzaka struggles through another first inning inside the park during a recent Red Sox game, a crude course in economics is under way off Brookline Avenue. There are buyers and sellers, neither of whom is willing to budge. The scene is something of a capitalist staring contest, an exercise in supply and demand. Except here, supply is shirtless in a backwards Red Sox cap, a lit cigarette in one hand, and a dozen tickets fanned out like a hand of gin rummy in the other. In a few hours, not long before David Ortiz will give the Sox a 5-4 walkoff win over the Tigers, there will be an announcement over the public address system in the press box. For more than seven years, the Red Sox have claimed that for every home game, the number of tickets sold and distributed has eclipsed the seating capacity of America’s Most Beloved Ballpark. But recently, the task of filling those seats has grown more difficult. Television ratings are down, and marketing campaigns have been revved up. The Sox are not the hot ticket they were five years ago, and the scalpers on Brookline Ave. are feeling it, too. Rich, who declines to give his last name, has been scalping tickets for the better part of a decade. He is originally from Charlestown and says he used to work with heavy machinery until an accident left him with a titanium plate in his neck. When a few acquaintances first asked if he would be interested in the ticket business, he balked. “I thought, ‘How could anyone make a living doing this?’ ’’ he said. He found out fast. Rich claims he made about $100,000 in his first year re-selling tickets to NASCAR events and Sox games. This year, though, he says he’ll be lucky to bring in one-third of that. A fellow re-seller overhears Rich’s claim. “[Down] 70 percent? It’s way worse than that,’’ said the man. The other scalper is silver-haired with a belly and a limp. He’s wearing a Red Sox jersey and isn’t interested in saying much more. “Things are bad enough already,’’ he says. Business is better on this Saturday. Rich sells his 15 tickets in less than half an hour. Despite that success, he repeatedly cautions that that was a rarity. Come back during the week, he says. He claims that several times the previous week he was left holding a dozen tickets. A couple of blocks farther north on Brookline Ave., this season’s harsh market is more evident. Rich’s tickets were standing room and were going for about $100 each. On this corner, the available seats are field boxes and loges. This is the high-end stuff, another scalper, a man in a gray cotton T-shirt, says. And the high-end stuff is hard to move. Many of the buyers here have leather Blackberry cases clipped to their belts and shirts as crisp as the $100 bills they slide from their wallets. A customer with a woman and children in tow approaches one of the scalpers and inquires about the price. The customer nods. The number seems fair. He reaches for his back pocket. As the scalper asks how many the man needs, the misunderstanding becomes clear. The customer shakes his head and goes on his way. Rich wistfully talks about the pre-championship Red Sox and laments the way things are now. Back then, a $50 ticket went for $200, easy, he says. Now there are days where he struggles to get 50 percent above face value. The scalpers have different theories for why things have gotten so bad. 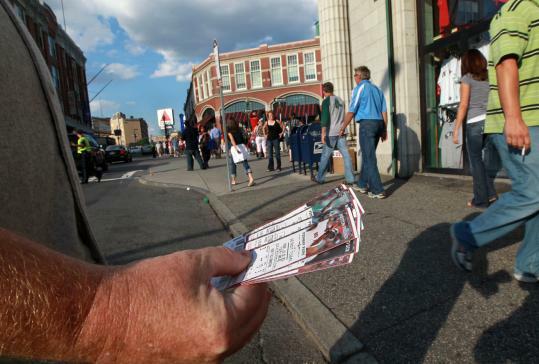 “Ace Tickets, they’re the real scalpers,’’ the silver-haired man in the Red Sox jersey says as he walks away after declining to be further interviewed. Some blame a rise in ticket prices. A seat at Fenway Park is the second-priciest ticket in the majors (a $52.32 average; the Cubs tops the majors at $52.56), and in order to make a profit, re-sellers have to adjust as the price changes. With the nation’s economy struggling, Rich believes the chance to enjoy a night at the ballpark is no longer available to everyone. One thing all the scalpers agree on is something they have noticed the last few years. Since 2007, they say, many people have become sick of the Red Sox. The new market has called for new tactics. Rich says that years ago, the scalpers would just stand under the sign at Copperfield’s Bar just past Yawkey Way. With tickets scarce, people would come to them. Now, few scalpers ever are camped out for long. The shirtless man in the backwards cap is the most active among them. He repeats the request 16 times in one minute, speeding up when the foot traffic at the station becomes heavier. Ten minutes before game time, he briskly moves with the throng flowing over the thin patch of sidewalk off Brookline Ave. over the Mass Pike. With game time closing in, the question has changed. Now, it’s the middle of the first inning, and he’s one of several sellers occupying the corner off Brookline Ave. The game has started but his price remains fixed. His field box seats, with a face value of $52 apiece, are going for $150. Like many of his colleagues, he is having trouble moving the seats. To a casual onlooker, the solution seems simple. Drop the price. But when the idea is brought up, the man in the gray cotton T-shirt quickly shoots it down. He doesn’t wait for an answer. He explains that no one would be willing to buy milk at full price. The integrity of the product would be compromised. So the shirtless man in the backwards cap waits, eyes wide. Every 30 seconds or so, he approaches a bystander. This time, it’s a man in a black polo shirt and khaki shorts. “You need tickets?’’ the scalper asks. Robert Mays can be reached at rmays@globe.com.